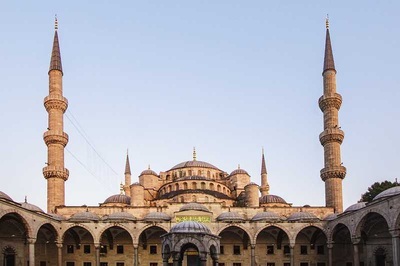 The mosque is also popularly known as a fascinating structure its six minarets because it is only six minarets mosque in Turkey. There are many legends about this mosque; one of them is about minarets. Sultan ordered minarets to be made from the gold to create a different style but there was no money enough. Instead of this Sedefkar Mehmet Aga decided to build six minarets to see its uniqueness. 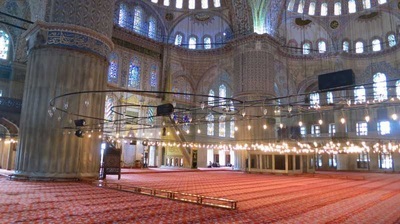 The mosque is lightened by 260 windows. It’s part of the worship sizes 64x72 meters and its diameter is 23,5. There is a heavy gateway made from iron in the entrance of the west yard. The shape of this gateway shows the importance of the mosque because at the time even sultan had to be careful when he came in this gateway. The mosque has a rectangular shape.Also there is a central dome supported by 4 half-dome ,4 different ways. 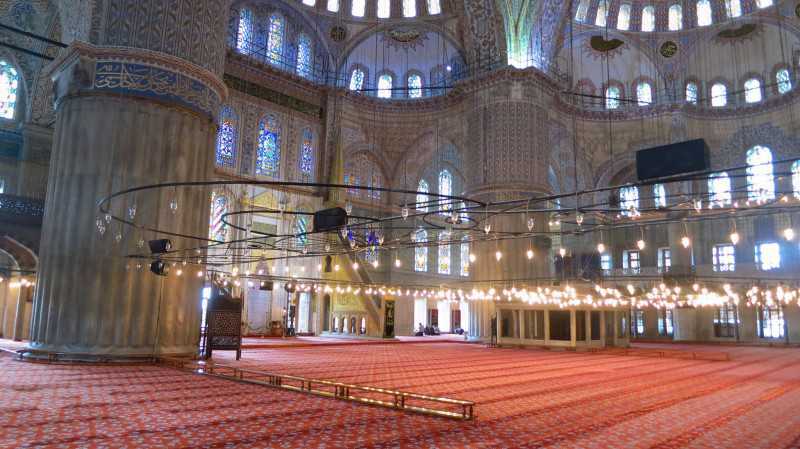 Blue Mosque has a feature like social complex by including madrasa, Sultan Resting Mantion, Turkish bath, fountain, hospital, Mekteb-I Sıbyan, rental rooms and homes except from mosque. 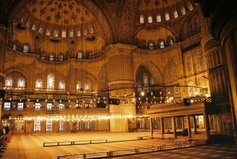 The other important structure of Blue mosque’s social complex is Sultan Resting Mansion which is a place built for Sultan in order to rest after and before pray. Within this place there are many tombs including Sultan 1. Ahmet, his wife Kosem Sultan, and their sons 4.Murat and 2. Osman in the northwest. Besides being tourist attraction point, it's also an active mosque, so it's closed to non worshippers for a half hour or so during the five daily prayers. Best way to see great architecture of the Blue Mosque is to approach it from the Hippodrome. (West side of the mosque) As if you are non-Muslim visitor, you also have to use same direction to enter the Mosque. Today, there is a place named ‘Arasta’ in the back of the mosque, surrounded by Mosaic Museum, the shops selling touristic materials. 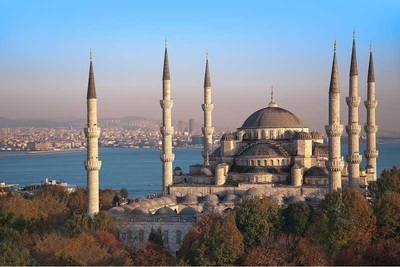 Blue Mosque is one the most popular tourist attraction that also welcomes the famous people including The leader of Catholic Church and USA’s Old President, Bill Clinton visit this mosque two times. 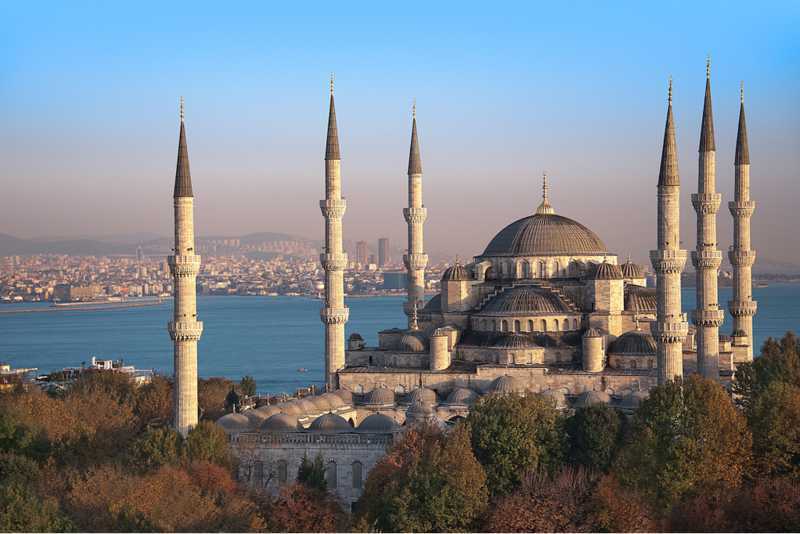 HOW TO VISIT BLUE MOSQUE? WHAT IS THE RULES? 1) Plan your visit to the Sultanahmet area of Istanbul, so that you better arrive mid morning. Pray happens five times a day with the first call to prayer at sunrise and the last one at nightfall.The mosque closes for 90 minutes at each pray time.Avoid visiting a mosque at pray time (Especially Midday praying on Friday) or within a half hour after the ezan is chanted from the Mosque minarets. 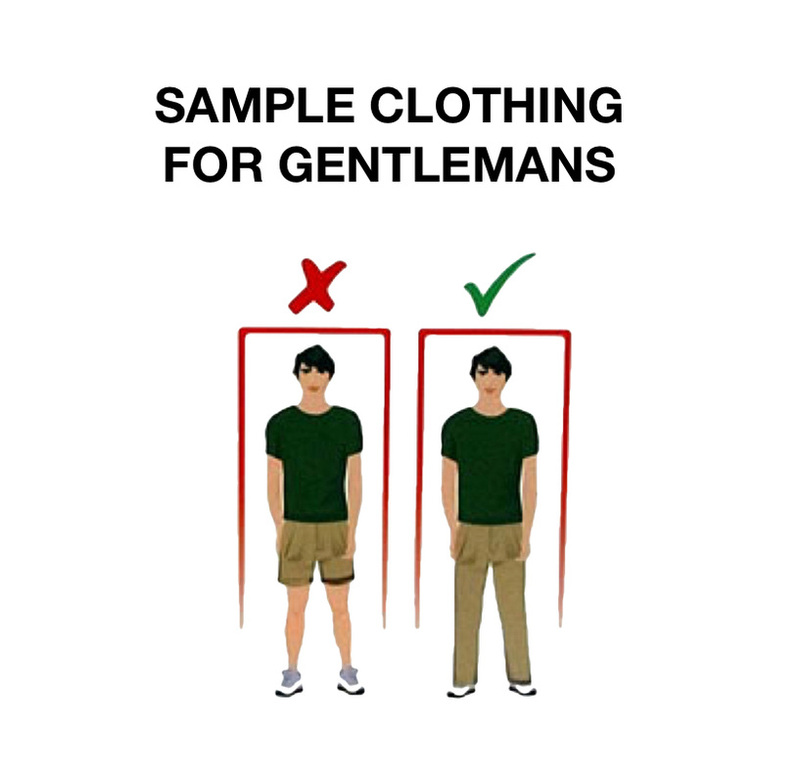 2) Before step in to Mosque, take off your shoes and put in plastic bags provided at the entrance(Free of Charge). 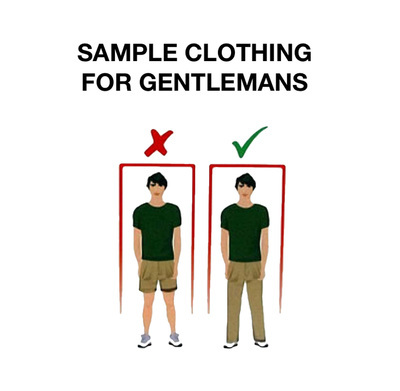 This is required of all persons as part of Muslim tradition when entering a mosque. There is also no charge to enter the Blue Mosque. 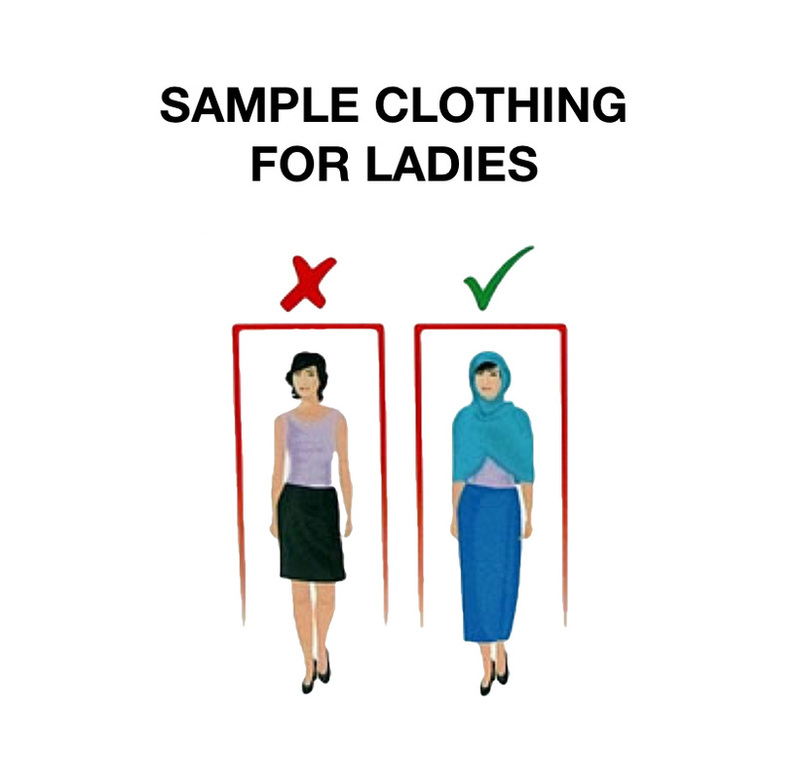 3) If you are women wear a head covering when entering to Blue Mosque.Head coverings are available at the Blue Mosque entrance for free. Place the fabric cover on top of your head with equal portions hanging on both sides. Take one side and wrap it around your neck, tossing it behind your back with covering your shoulders. Don't cover your face, the covering is meant to hide your hair only. 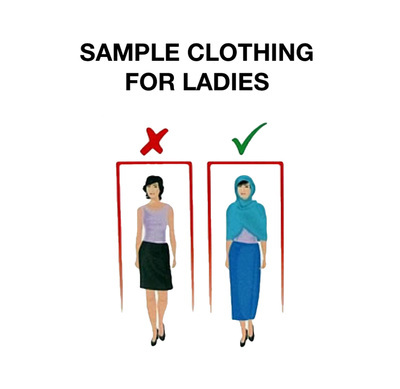 4) When you are inside the mosque, remain quiet and don't use flash photography.Since this is a place of worship, avoid staring or taking picture of those who are praying.Visit the mosque respectfully and quietly.At the Mosque exit, you can put used plastic bags in designated bin bags and return head covers to duty staff. Muslims pray five times a day according to the basic tenets of Islam.The timings of these prayers are spaced fairly throughout the day, so that one is constantly reminded of Allah and gives opportunities to seek His guidance and forgiveness. Muslim call to prayer (Ezan) is chanted six times a day.The exact time of the ezan changes each day due to rotation of the earth,revolution around the sun,various latitudes of the earth's locations and daylight savings time.Therefore Islamic prayer times were not set based on clock but traditionally set according to the movement of the sun.These timings being advised by The Presidency of Religious Affairs of the Republic of Turkey. Here below is the names of the calls-prayers in Turkish and Arabic. If you like to check real time praying times, you can click here . Four minarets stand at the corners of the Blue Mosque. Each of these fluted, pencil-shaped minarets has three balconies (Called Serefe) with stalactite corbels, while the two others at the end of the forecourt only have two balconies.Before the muezzin or prayer caller had to climb a narrow spiral staircase five times a day to announce the call to prayer.